White paper on crime 2004 Part1/Chapter1/Section1/3. Fig. 1-1-1-8 shows the numbers of reported cases,cleared cases,and persons cleared,and clearance rate for theft over the last30years.A sharp rise in reported cases and a sharp fall in the clearance rate for theft were observed in recent years,but these trends have changed since2002. Reported cases continued to increase in each year from1998to2002,by about120,000,120,000,220,000,210,000,and37,000,respectively.However,in2003,they decreased for the first time in nine years,by141,644(6.0%)to2,235,844.As cleared cases increased for two years,the clearance rate increased to19.4%in2003. Theft includes serious offenses,such as invasive theft,pick-pocketing,snatching,and car theft,which are called serious theft and serve as a good index of crime trends.Reported cases for such offenses in2003decreased by9,328(1.9%)from the previous year to469,148,accounting for21.0%of all theft.The serious theft percentage has been between18%and21%since1989.In2003,the clearance rate for serious theft was30.0%,higher than that for all theft,recovering by2.0points from28.0%in2002(Source:Criminal Statistics by National Police Agency). Fig. 1-1-1-9 shows the number of reported theft cases by type,i.e.invasive thefts,non-invasive thefts,and vehicle thefts,over the last30years. Fig. 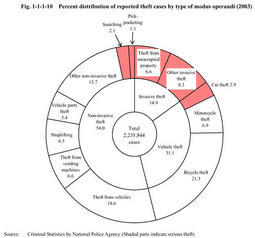 1-1-1-10 shows the percent distribution of reported theft cases in2003,by type of modus operandi. Reported cases for invasive thefts with the use of lock-picking tools were29,211in2000,19,568in2001,and19,121in2002(nationwide statistics have been available since2000).In2003,they fell remarkably to9,351.However,instead of them,such invasive thefts have become common as thumb-turn knob twisting(a modus operandi by drilling a hole into the door,inserting a special device into the hole,turning the thumb-turn knob(the knob to open and close the deadbolt)with the device,and opening the door),and modi operandi by burning window glass with the use of ignition devices,i.e.portable burners and lighters.In2003,the number of thumb-turn knob twisting cases known to the police was4,366(up3,526from the previous year),and theft with the use of ignition devices5,585(up4,096)(Source:Data by Criminal Investigation Bureau,National Police Agency). Reported non-invasive theft had also been on the rise since1991,but declined in2003from the previous year for the first time in13years,by56,939(4.5%)to1,206,820.However,like invasive theft,they remain at a high level,the third largest figure following2002and2001. Fig. 1-1-1-11 shows the numbers of reported cases over the last30years for pick-pocketing and snatching,which are included in the category of serious theft. Reported cases for pick-pocketing fluctuated in the20,000-30,000range since1989,and there was no significant difference in between1974and2003.On the other hand,reported cases for snatching increased gradually throughout the Showa Era(before1987)and increased sharply from the beginning of the Heisei Era(after1988),and have recently been much more than pick-pocketing.Compared with pick-pocketing,which requires specific skills,snatching is an easier and more violent modus operandi.The sharp rise of snatching coincides with the recent increase in robbery,and particularly street robbery.Reported cases for snatching in2003were46,354,a decline of6,565from the previous year.It seems that policing measures against street offenses have been successful. Reported vehicle thefts,after decreasing in2002,again decreased to695,791(down79,644from the previous year)in2003.More specifically,motorcycle and bicycle theft fell remarkably by43,663and37,531respectively,while car theft increased slightly,by1,550. In addition,theft committed by the special modus operandi to destroy ATM booths and machines by construction equipment and steal the money inside has become common.According to the Criminal Investigation Bureau of the National Police Agency,this modus operandi was observed in nine cases in2001,57cases in2002,and44cases in2003(these figures include attempted cases).